Rice is central to Korean cuisine, and the word rice in Korean ("bap") can also be used to describe meals or food in general. Many Koreans use rice, which is very starchy and sticky, as glue. Moreover, a number of Korean women wash their face in rice water as a beauty regimen. And rice porridge ("juk") is food for infants and the sick. Rice takes the place of American staples bread and butter in the Asian household, so it's almost impossible to exaggerate its importance on the Korean table. These recipes for five fabulous Korean rice dishes are a must if you're serious about learning to make Korean cuisine. Bibimbap has the distinction of being one of the most well-known Korean rice dishes outside of Korea. The traditional dish combines colors, textures and a snappy flavor to make it a highly customizable mixed rice dish. 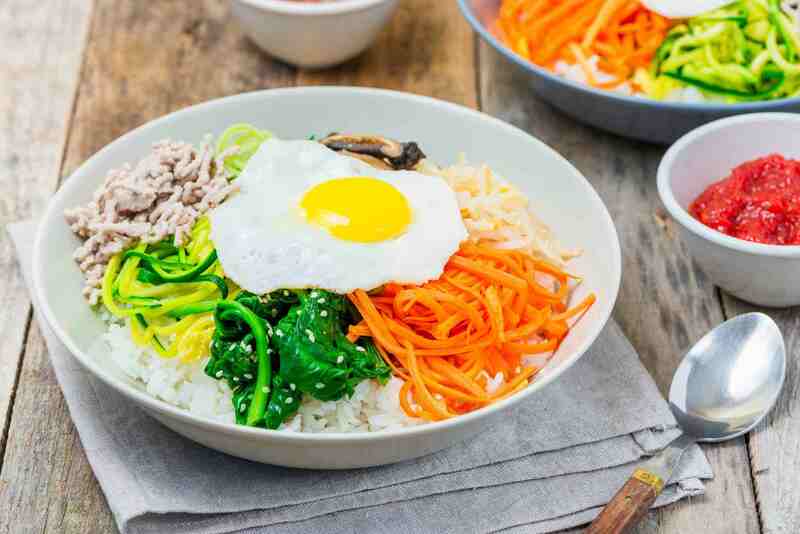 You can make bibimbap with meat or with a delicious egg topping. The meal is also made with several vegetables. You can prepare up to a half-dozen veggies, such as sprouts or mushrooms, with bibimbap or use three or four. Whichever vegetables you have in your fridge will likely work well with bibimbap. That's not the only good news. Korean food is notoriously spicy, but with bibimbap, you can control the spice content. If you're a typical Westerner, who prefers your food blander, use less chili red paste rather than more. Korean rolls are a portable rice meal that you can fill with any vegetable, meat and seafood combination that you want. That means if you're a pescatarian, you can fill the rolls up with only seafood; if you're a vegetarian, use only vegetables. And if you're an omnivore, fill the rolls up with all of the above. If times are tough for you and you're looking or a meal to soothe you, then look no further than kimchi bokumbap. This meal is known as being one of the best Korean comfort foods. Kimchi bokumbap takes regular fried rice up a notch. It's also easy to prepare, given that you can make the meal from leftover kimchi (fermented vegetables, especially Napa cabbage and daikon radish) that's seen one day too many in your refrigerator. When that happens, kimchi becomes a tad sour, which is a taste that makes this fried rice dish shine. In addition to kimchi, you can add in Canadian bacon, thinly sliced beef, pork or ham for protein. If you're a pescatarian or vegetarian, substitute the meat for shrimp or tofu squares. Kimchi is a great dish not only because of its taste but because it is chock full vitamins and minerals, making it a very healthy food choice. Kimchi fried rice is Korean home-cooking at its absolute best.